Do you ever lie awake at night wondering if there is a highbrow version of nachos? An antithesis to movie nachos (read: pump cheese), if you will? Could it exist? 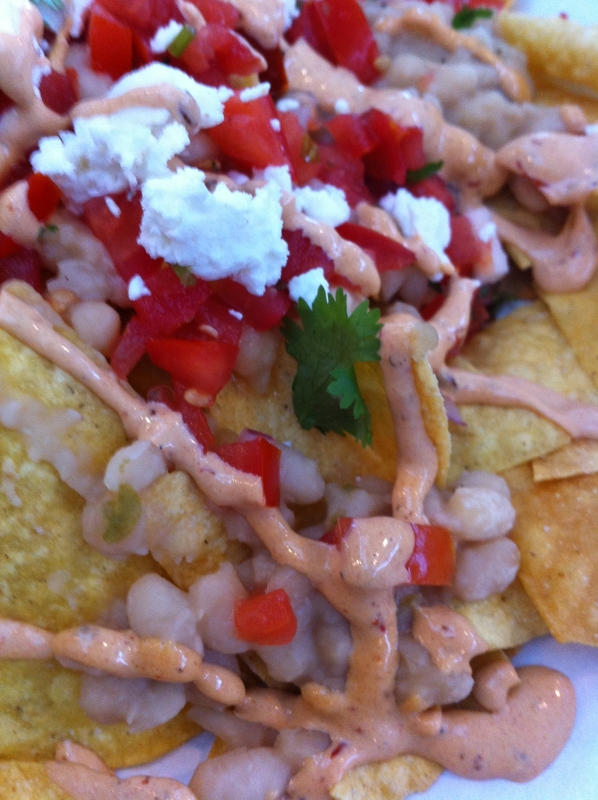 A combination of my beloved traditional nacho-ey goodness with foodie creativity and deliciousness? Believe it or not, these are things that I actually think about. A sad statement, perhaps, but true nonetheless. And no need to continue to ponder this one, my fellow nacho lovers. C CASA Taqueria will serve you up a version of nachos fit for a true foodie on your next visit to Napa. Oxbow public market is just pure awesomeness. There is no other way to describe it. Having visited before, it was no surprise to me when Frommer’s named it one of America’s Best Public Markets. Trust me, if you are in Napa it is not to be missed. The only downside of visiting is that I want to try so many different things that I wind up cursing my stomach for how quickly it feels full. My desire to consume the food there often outlives my ability to actually consume it. I’ve had fabulous meals at Pica Pica and Ca’ Momi previously and today I had my sights set on one place and one place only: C CASA. I did some pre-visit reconnaissance and knew they served nachos. So on this sunny, perfect, California morning, my mission was clear. My stomach was empty. I was good to go. 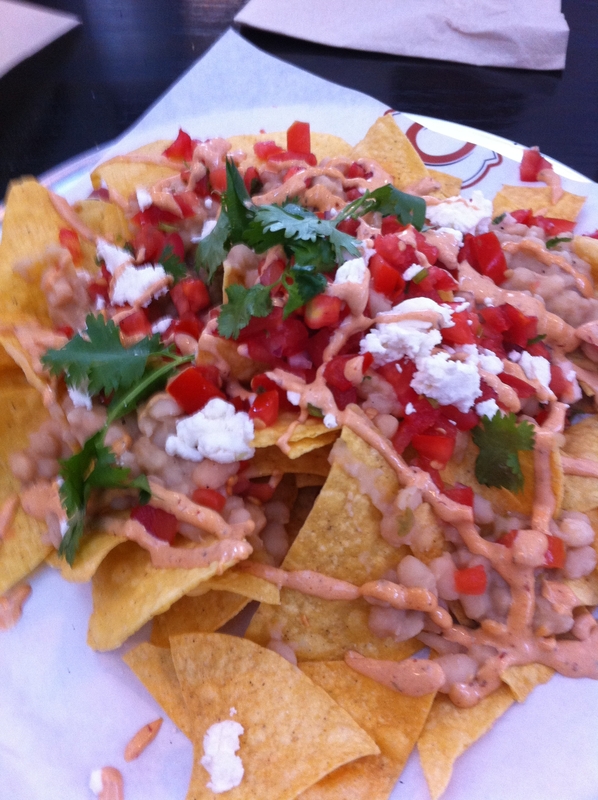 Listed under the “Small Plates” section of their menu, C CASA offers “Nachos Noti”. Upon reading the description I instantly realized that these are no ordinary nachos: “C CASA chips with our black beans or white beans, pico de gallo, goat cheese & chipotle aioli.” After speaking with the friendly staff, I learned the white beans are vegetarian while the black beans are not. White beans it is. When my buzzing pager lit up and bounced around letting me know my nachos were ready for pick-up, I was filled with anticipation. And wow, was I impressed with these nachos at first sight! I knew from the menu description what the toppings were, but the presentation exceeded my expectations. The house-made chips were so fresh and delicious. The perfect texture and crunch factor and a great vehicle for all the amazing goodness that was topping them. When you take the first bite of these nachos, you get a wonderful flavor combination that packs a punch. Wow! The beans have a very smoky taste while the chipotle aoili gives a great kick of rich, creamy spiciness. The goat cheese is a delicious, genius, rebellious choice that I’m completely on board with. The tomatoes were fresh and delicious and found myself taking a surprising amount of enjoyment in the large pieces of cilantro. If asked beforehand, I would have thought I preferred it chopped up small with the tomatoes. But these are clearly no ordinary nachos, so why should their pico de gallo follow standard procedure?